I have mentioned on previous posts how happy I am that major grocery stores (like Walmart and Loblaws) now have a lot of organic foods under their own brand (President's Choice, in this case). It makes organics so much more affordable. And this product is another great example of that. The taste, like many other organic products, is great. 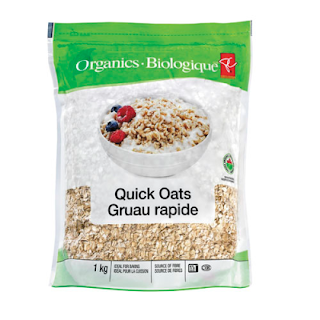 I also love that it is much more affordable than my previously favourite quick oats. I usually have this with soymilk and sometimes blueberries or raspberries. I also occasionally add hemp seeds to give a different flavour and get a serving of protein in. And very rarely, when the sweet crave is strong, I put a bit of maple syrup or honey on top. The other reason I love this oats so much is because it doesn't have any refined sugar. It's still very hard to find organic breakfast cereal without refined sugar, so this is one of my go-to breakfast meals. This had become my go-to quick oats until I discovered another one (stay tuned for the post!). I would still recommend this, though, and I occasionally still buy it when it's on sale, or I won't have time to go pick up the other one.